Jenny of ELEFANTZ: The Holly Bird Designs and a Giveaway! 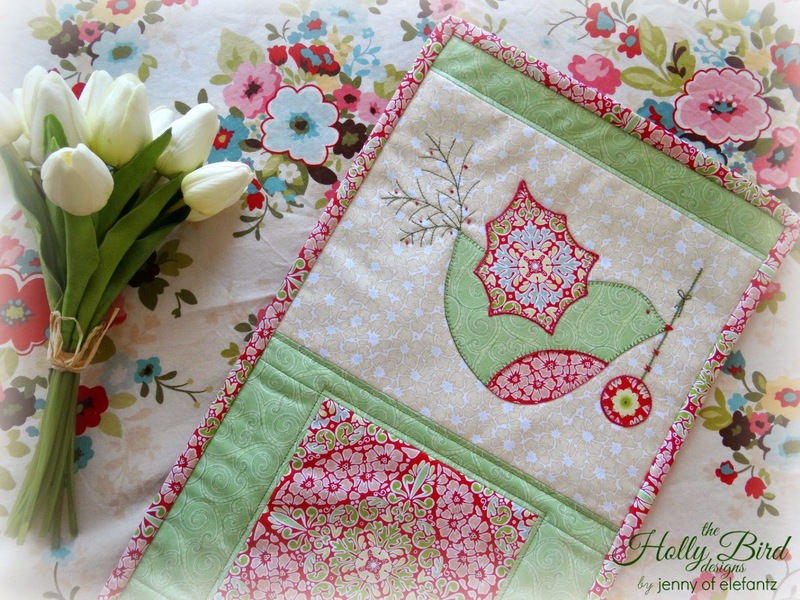 The Holly Bird Designs and a Giveaway! I have a love for birds and I think Christmas is the most special time of the year so I've designed a set of six projects that celebrate both my loves! The full six pattern set is now available HERE in my shop for the introductory price of $17.95! 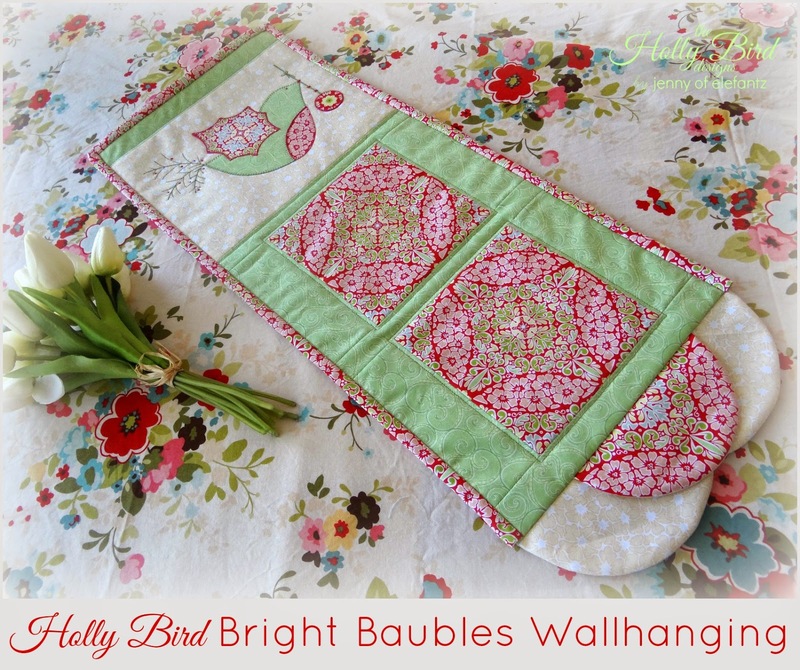 That's just $3 a pattern - what a Holly Bird Christmas blessing! Now because I've heard a lot of oohing and aahing over some of the fabrics I've used I thought you might like to be part of my Christmas Bundle Giveaway? I didn't use all these fabrics in the Holly Bird Designs, but I did use some, and the rest will be used for something else I have up my sleeve. But before I go playing with the rest of my Christmas Scandi fabrics I've cut five 6.5" x 44" lengths for one lucky winner to play with too! So how do you go in the draw for this sweet Scandi Christmas fabric? Just click on as many as you can and spread the news for me! Leave one comment for every social media button you click, and if you get my Friday newsletter delivered to your email inbox (it will be sent out in the next hour) you can even forward that and leave a comment here! If you purchase the pattern set HERE you can leave 2 extra comments! 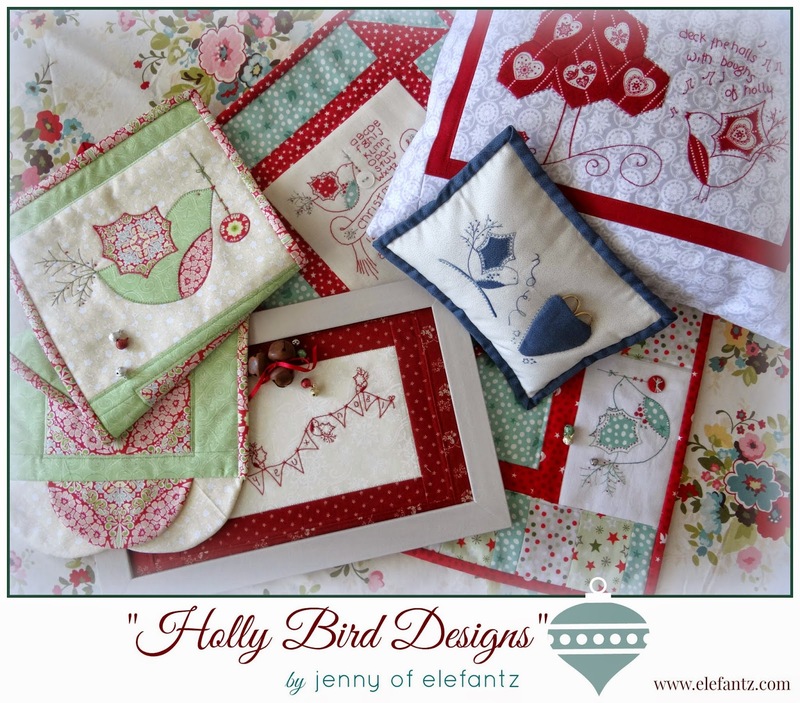 PLUS: in your comments tell me which Holly Bird design is your favourite and why. I'd love to know! I will post internationally so everyone has a chance to win! The giveaway will be drawn by Mr E on his birthday, which is September 17th. Mr E chose his birthday number, 17! 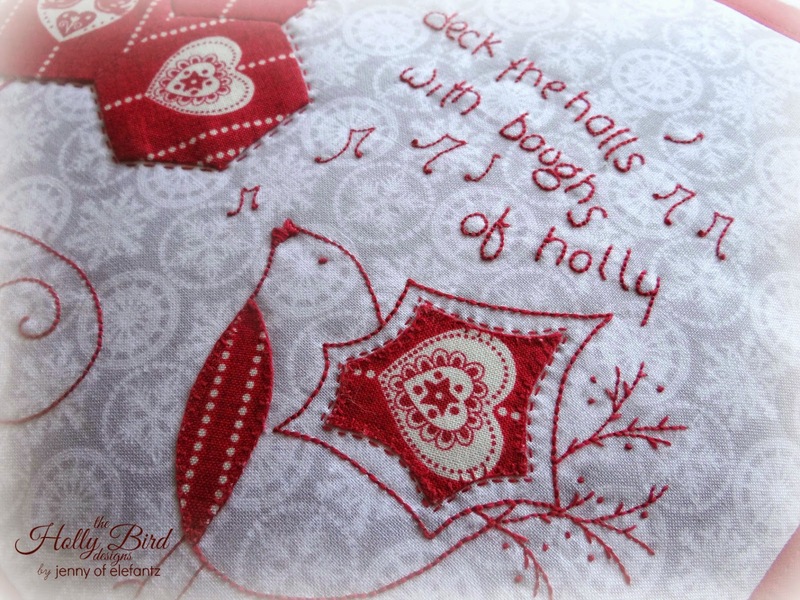 Have a brilliant weekend, and hopefully you may find yourself with a Holly Bird Design or two in your stitching basket. I am off to thankfully put my feet up after a very busy week, and I might just stitch something...wheeeee!! Lovely designs and fabrics. I've shared via email. My favourite? Very hard to choose. If pressed I'd say the pincushion. It's the blue. Shared on Facebook too. You're very generous Jenny. I have share your giveaway on my facebook page. LOVE Deck the Halls pillow.. LOVE it. Ha! Favourite! Impossible to choose! Saw the first one - loved it, then the next - loved it too, then the next and next and next -the LOVE never stopped! Sigh...they are all gorgeous, gorgeous, GORGEOUS! The blue is definitely my favorite, but the wonderful fussy-cut hexagon tree and songbird run a close second and the table runner a very close third. Hard to choose! I forwarded the e-mail to my group of Christmas Shoebox Swap friends. The fabrics are lovely! Just in case I forget (as I'm prone to doing a lot lately), a happy happy birthday to your sweet husband on the 17th. 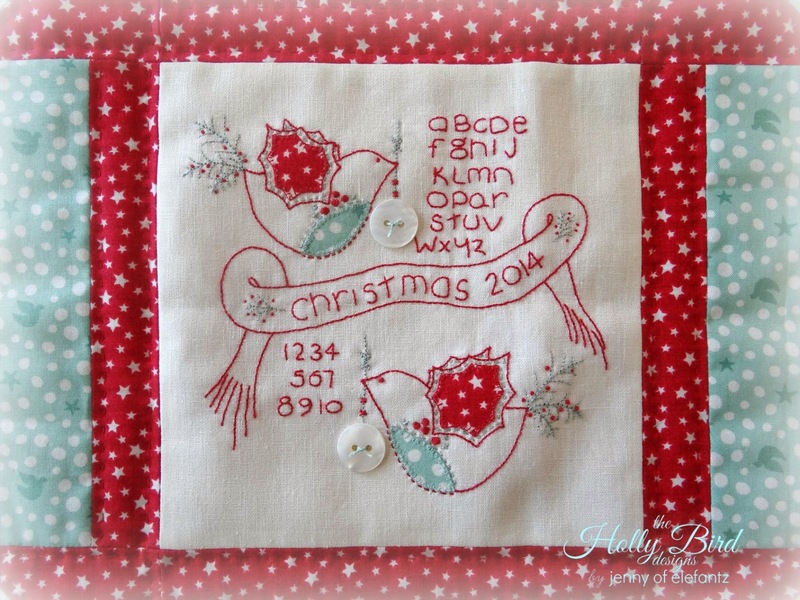 I love the holly bird on the sampler. They are all gorgeous though. I just forwarded my email newsletter to 7 friends. Hope you get some new customers and followers. 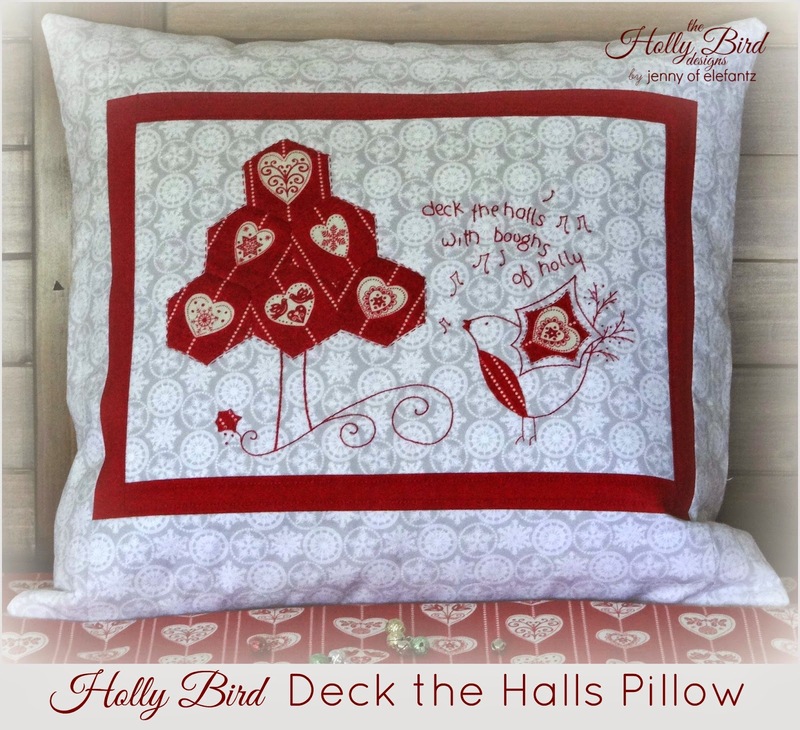 Love love love the new holly bird Christmas patterns. Jenny I just shared your post on my Facebook and tagged you in it dear. 'Tis the season for Christmas lovers to start to make and your festive designs see us spoilt for choice. My favourite is the Rejoice Table Runner as I am fond of patchwork and love the colours of yesteryear. The simplicity of your holly birds adorns it beautifully. Thanks for the opportunity to enter your giveaway. Love the Scandi fabrics. Hi Jenny I just shared this via my Google+ account. Beautiful designs! Love those gorgeous fabrics..I share on my FB timeline! Wow great finishes and my fav one is so hard to choose but I love Noel bird pin cushion ..I love to collect pin cushions so they always have a special place in my heart.. Please count me in your lovely giveaway..it's so sweet. 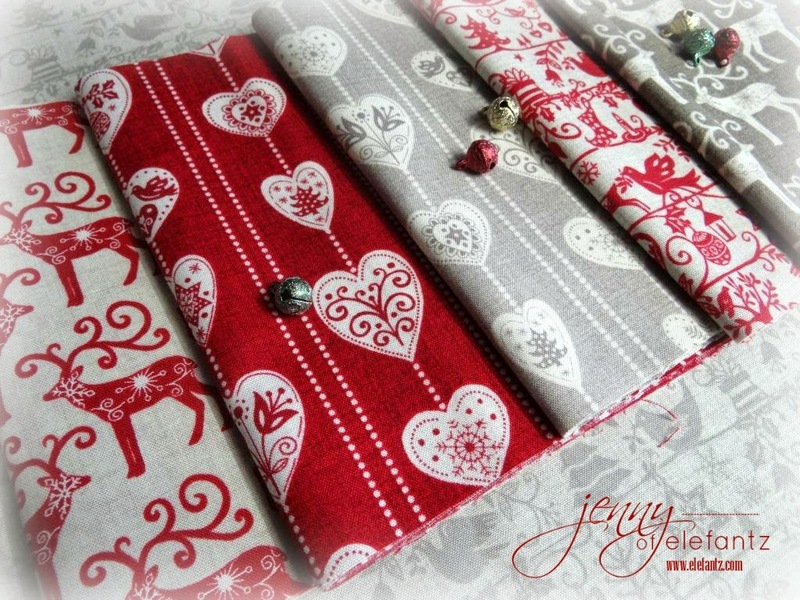 Beautiful designs from the very talented Jenny of ELEFANTZ ready to stitch for Christmas. 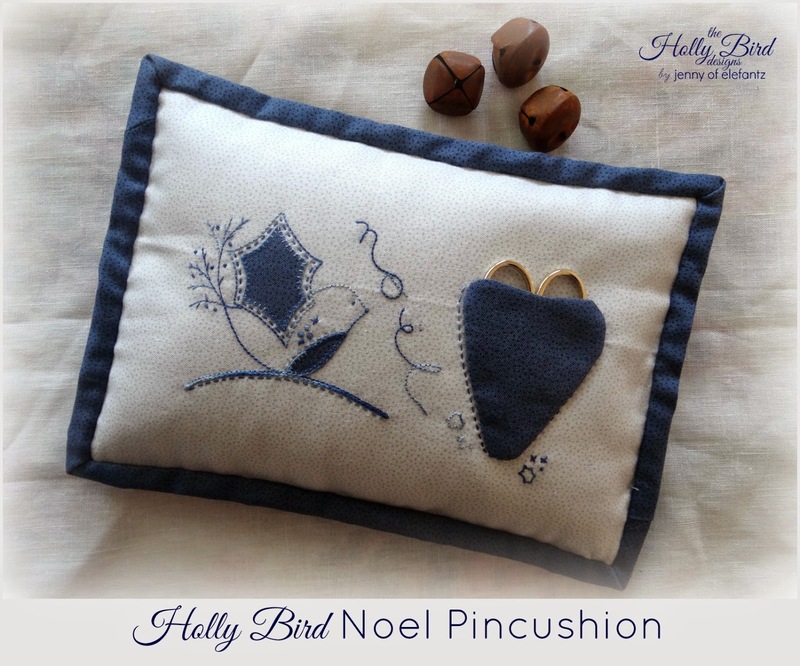 My favourite has to be the Noel Pincushion ... love the blues ... not really into "Christmassy things" however the designs are really, really sweet. Fussycutting on the holly birds makes them even more adorable. thank you, Jenny. 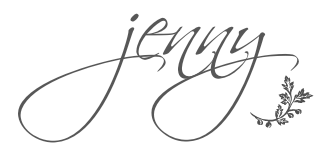 Hello Jenny forgot to mention - Shared on Pinterest and Facebook and emailed to 8 friends. Shared on Facebook. 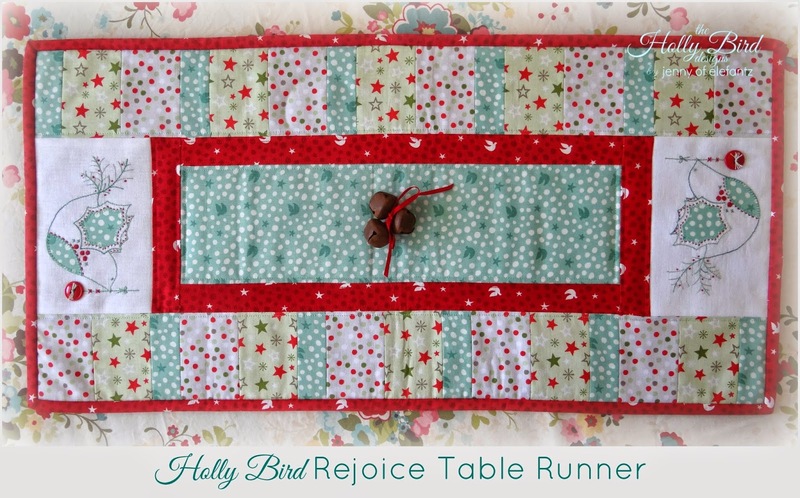 I love your Holly Bird Rejoice table runner. Adorable. Shared on Pintrest. I enjoy stitching your designs. Sharing on email. Will send to all my family that does stitching. Thank you for this opportunity. I just enjoy following you and seeing all your fascinating ideas and work. I like them all, but the blue is lovely. Thanks for the chance to be a part of your giveaway. I love the tablerunner! You are so talented, Jenny! I pinned this post to my embroidery page! posted this to facebook. love your birds. Tough choice... pin cushion but with red. You are sew talented! Love all of them! I love all your designs. I follow your blog, on facebook and pinterest! I love them all, but if I have to choose just one, my choice it the Joyeux Noel Stitchery. I shared on FB. 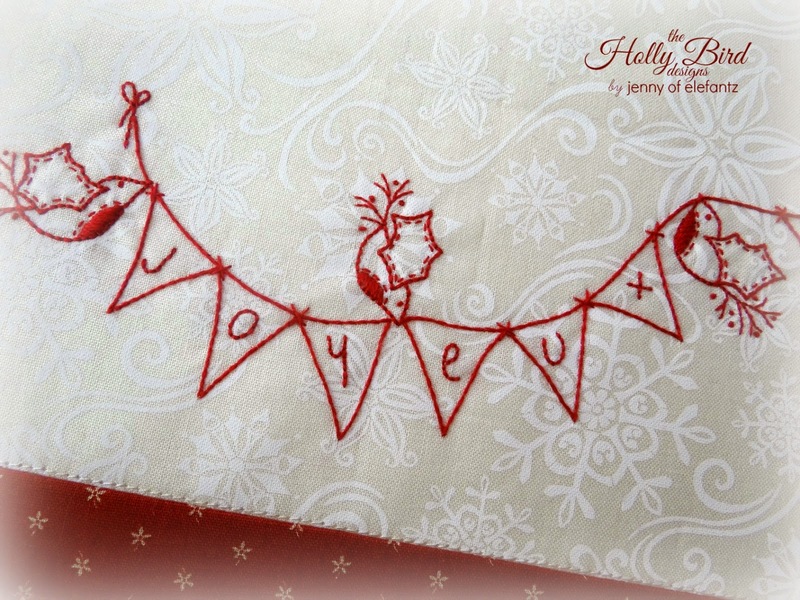 I love the Joyeux Noel Stitchery. This is such a sweet stitchery. I've already bought it and I'm looking forward to making something with this very charming little bird. I really liked the pincushion and the garland. You are a very clever designer. You've come a long way since Esperance! You have such a great sense of style and beauty. I love all your designs. Adorable bird designs. Cute fabric. I shared on Pinterest. I shared on Facebook, too. And I shared on Twitter. How exciting, thank you ! I shared on Pinterest! Love your designs. Well, you've done it again, Jenny! These new designs are so sweet and gorgeous. The churn dash block is my favorite! I do love the birds also, so sweet! Great fabric! jenny i love every thing you make! Pinned! I'm torn between the pincushion and the pillow as favourites, but they're all really cute. I love your sweet designs! I have pinned on my board on Pinterest and I have bought the patterns! I like the little pincushion it's so nice, simple and useful! The fabrics are very very nice! They are all lovely! I think I'd choose the table runner as my favorite. Pattern Request: I know you must hate it when someone requests a pattern, but I would love to purchase a birdie advent calendar wall hanging. 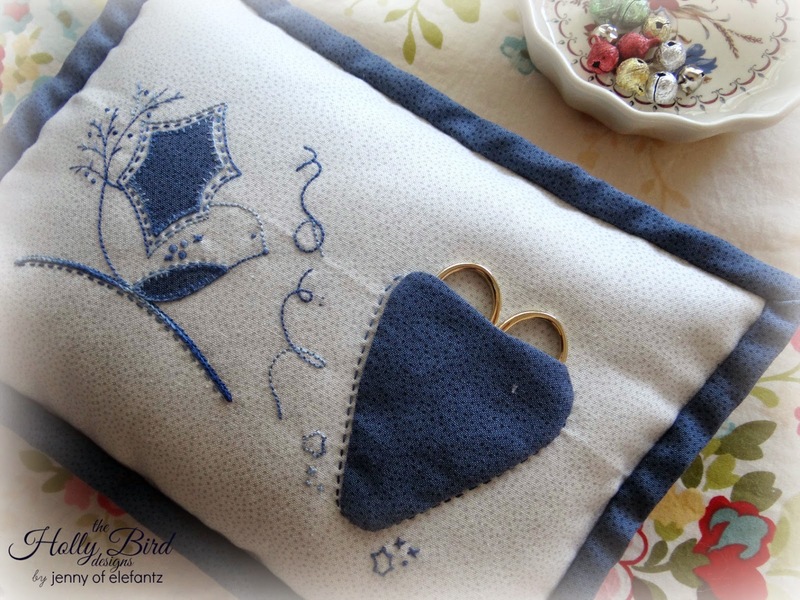 A cute birdie for each day with a tiny pocket to include tiny treasures. I love that cute Joyeux Noel pattern. I love the Christmas Sampler, because I ADORE those birds! That fabric is scrumptious! Thanks for the chance. 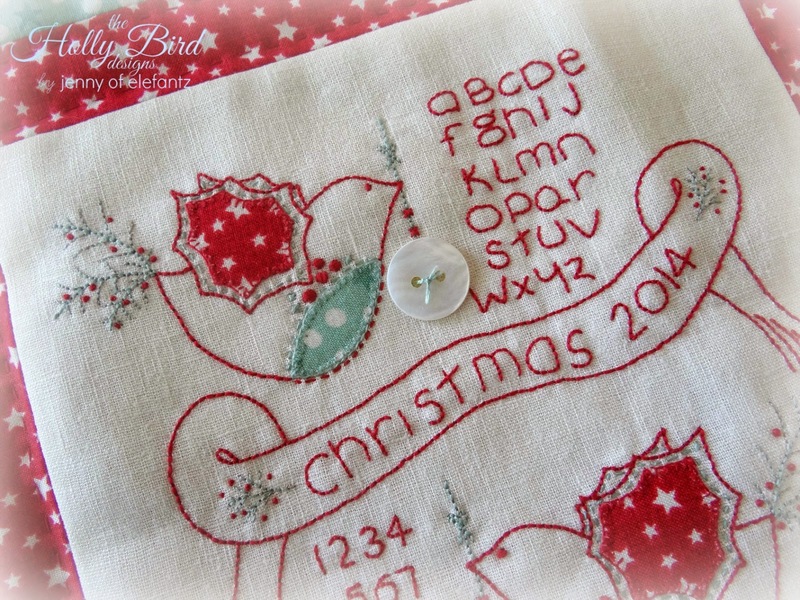 Shared your beautiful Christmas stitching oatterns and giveaway on Pinterest! I pinned this to Pinterest, under my boards Lynne Jaynes Tilley. 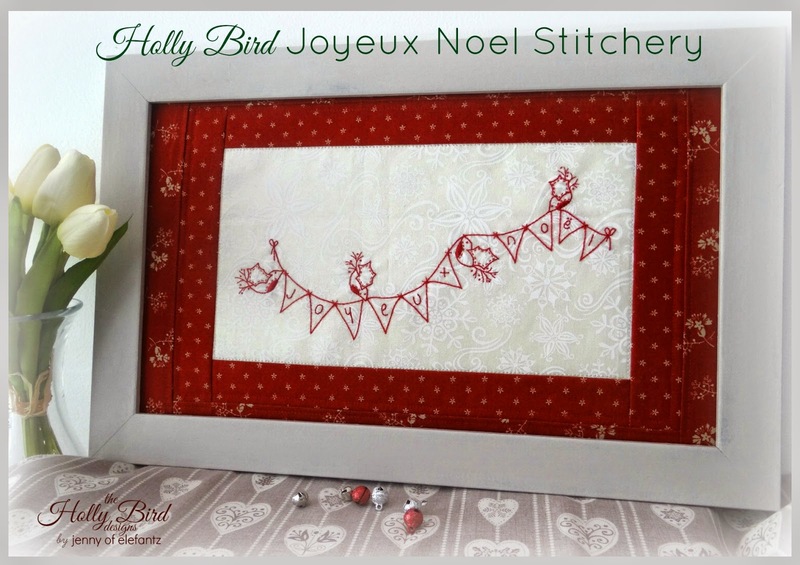 My favourite design is the Joyeux Noel Stitchery, love it! I <3 all the work you do ,they are the cutest sweetest designs . these Holy birds just top them off . I am having such a hard time trying to pick just one of the designs. My goodness favorite ? 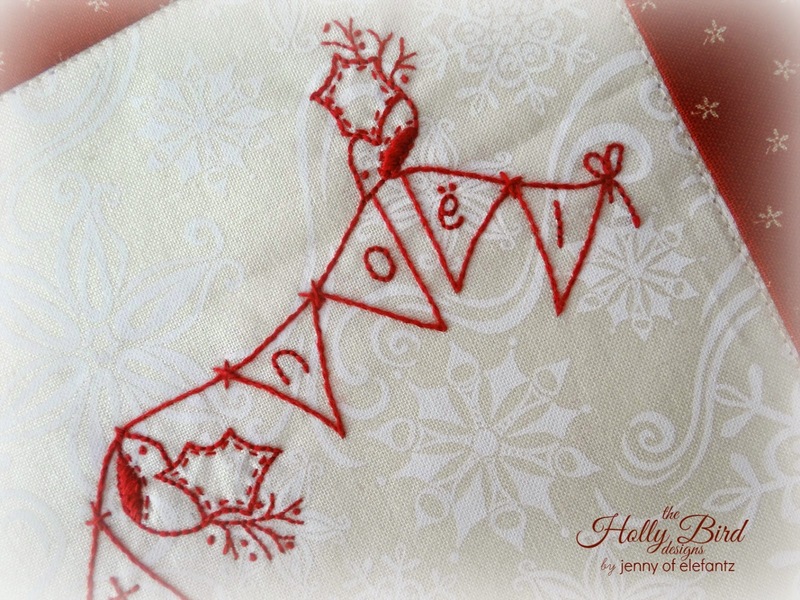 is it Deck the Halls Pillow or Noel Pincushion or the Christmas Sampler. I would sure like to make all three. The fabric you used is so lovely. for all your designs, I really enjoy them! Beautiful designs, stitching and fabric Jenny, love them all really but if have to choose, well impossible but maybe start with the cute pin cushion then sampler, table runner etc etc. Great gift ideas too. Have a wonderful weekend after completing that marathon. Hi Jenny, I love the blue design as it is my favourite colour. I like all of these new designs as the little bird reminds me of freedom, freedom we get through the birth of a Saviour. I love the table runner, so bright and happy! Posted to my facebook page! Another beautiful set of designs Jenny. They are all gorgeous. I love how you have made a Christmas tree out of hexagons. Loooove your projects!!!! & fabrics in give-a-way are beautiful!! I love the sampler mini pattern - too cute! Wauw, beautiful fabrics, they suits so beautiful with your patterns.I wish I could find them here in the Netherlands. I wil take a change to win this fabrics. I put your give-away in mu Pinterest board named Quilts and patchwork. I shared this post on pinterest. Happy Birthday to Mr. E! I love your designs and the calming effect it all has on the soul! Bless you. My favourite is the pincushion - I just love the blue and white combo, so fresh but Christmassy too. I have shared on facebook. What a lovely giveaway! I shared on Pinterest. 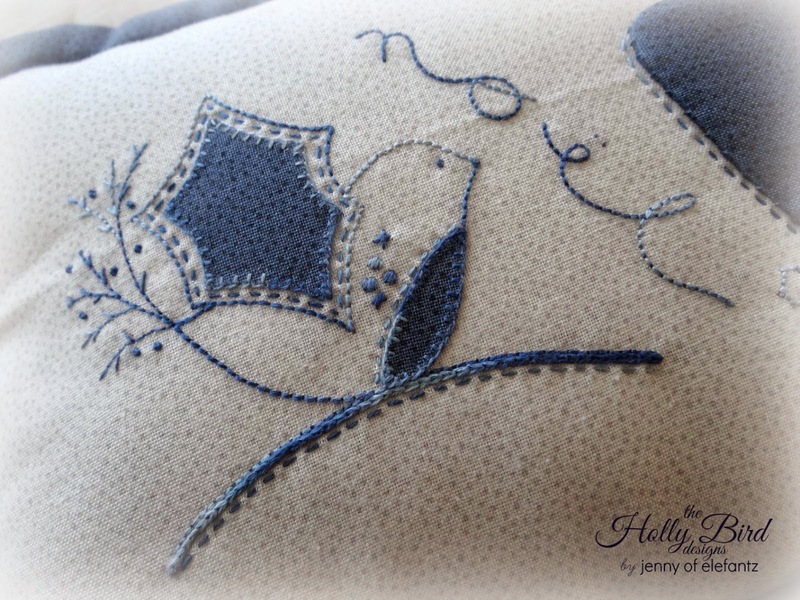 I think my favorite pattern is the Noel Pincushion because I love embroidery. I shared your post on my facebook wall. I pinned your post on pin interest. I recommended and shared on google. I think my favorite is Deck the hall, it is just the right amount of whimsy for me. Lovely designs Jenny , the sampler is my favorite . I just posted this giveaway on FB . Thanks for the chance . 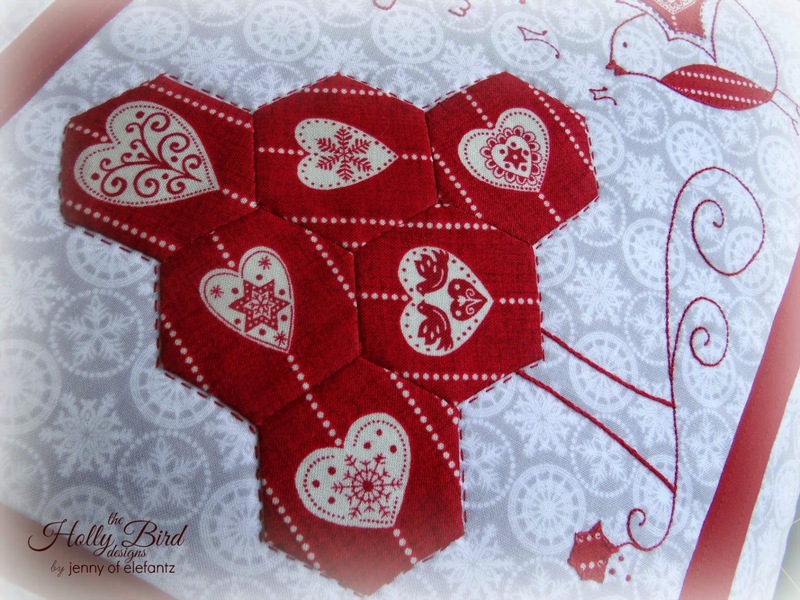 The Deck the Halls pillow is my favorite, but I love them all ... And shared the post on FB. I really like the table runner. The bird motif is so cute. I have shared this on FB. Oh and Sept 17 was my mother's birthday. She would be 92 if she was still here. What a gorgeous project range and fabrics. 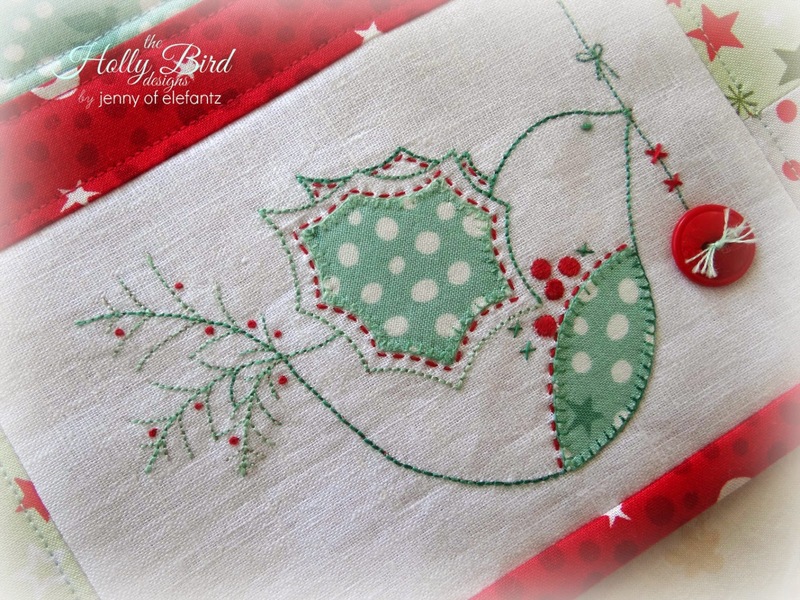 Love the HOlly Bird!! HELLO, love your blog+each of these projects on this post! 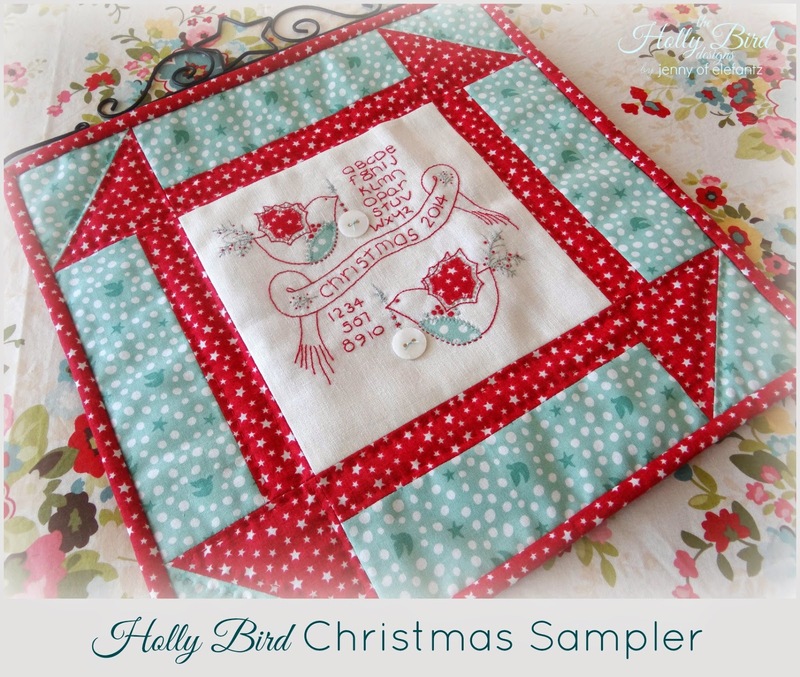 It's difficult to choose just one, but here goes: "Holly Bird Christmas Sampler"! Thank you for your inspiration+a great Giveaway! My favorite is the Christmas sampler but I love all of them. Thank you for sharing! I forwaerded your sweet newsletter to a friend. I love all the designs, I,too, love your birds. I picked the first one. I like the pocket for scissors...great gift. Luv the fabrics...I will try to post on Facebook...barb h.
Shared the newsletter with friends! buying pattern set - love the new designs! Phew! Thanks for all the chances to win your fabric! This is the second one for buying the pattern set - will make for some fun stitching on some upcoming trips. Thank you for all you do! 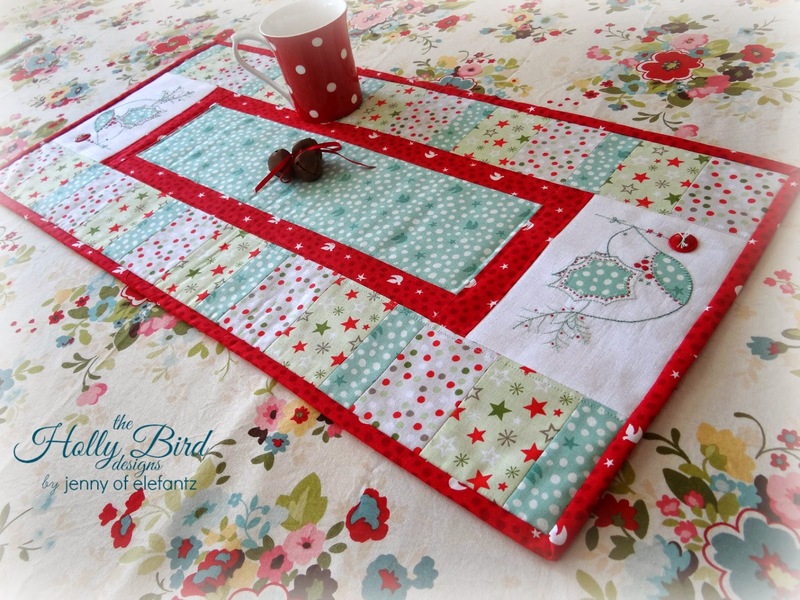 Shared via Google+...Love the Table Runner! Love, Love, Love,....I Love the Lord. I love your fabrics. I love your Patterns. Thank you for the chance of the give away. Are you really forcing me to choose? I love the embroidered bird--it's sooo sweet! Follow your blog! Love the fabrics. Always enjoy you talking about the seasons! Spring cleaning- I'm just thinking about fall cleaning. Having our first snow of the season in western Canada. I actually look forward to the cozy winter months. Lots of time to quilt and did I mention I'm taking an embroidery class at our local quilt store! I really love the pincushion. The blues are just lovely. I especially like the pillow with the hexagons! I've shared these designs on Twitter. Thanks for the chance, Jenny! I love the Rejoice table runner.